New Nokia Phone to Debut on October 4; Could be Nokia X7 - Playfuldroid! 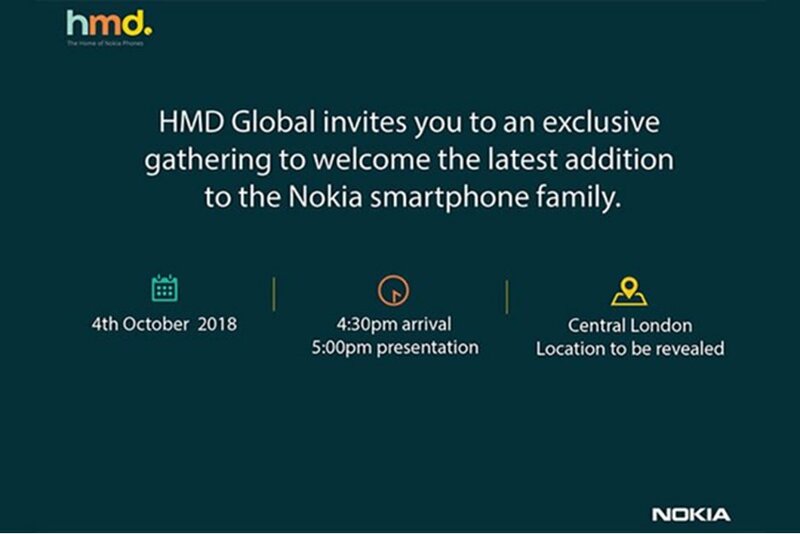 HMD Global has released a new press invite which confirms that it will be holding a launch event on Oct. 4. The press invite confirms that the unveil event will be held at 5:00PM in London. However, there is no information on the name or features of the device that will be announced on the said date. It is now being speculated that the Finnish firm may announce the Nokia X7 smartphone at the upcoming unveil event. There is no information available on the specifications of the Nokia X7 smartphone. However, recent reports have revealed that it could be fueled by Snapdragon 710 chipset. A recently spotted leaked render of the Nokia X7 suggests that it will be featuring a notched display design like the Nokia X6 and Nokia X5 smartphones. Also, it will be equipped with ZEISS branded dual rear cameras of the phone. Previous leaks had suggested that HMD Global may announce the Nokia 9 flagship phone with penta-lens setup in October. However, a recent report has revealed that the Finnish firm has pushed the launch date of the phone to 2019. It is now speculated to get announced at the Mobile World Congress (MWC) 2018 that will be held in February next year.